September 20, 2006 / Just when you thought HP was in enough trouble, they decide to try their hand at the teenage miracle diet market. With the slimming feature, anyone can appear more slender—instantly! 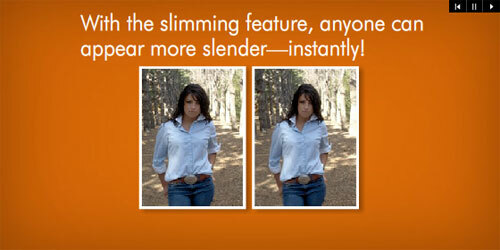 Only with HP cameras… Instantly trim off pounds from your photo subjects with the slimming feature! Slimming [camera menu item]: Compresses centered subjects for a slimmer look. Clearly HP have reached the point that their cameras can not be improved any further. This must mean that there are simply no more innovations left in the digital camera segment.